After Jeremy finished the roof, it was time to build the walls, windows and doors. First, Jeremy did the back wall by digging out and putting in a baseboard. He made sure it was nice and level! Keeping the baseboard level is important to keeping your wall panels straight. You can see how out of plumb the garage building is in relation to the coop he's building here. The whole building is tipping forward. But his boards are nice and plumb. Here you can see how he installed 2x4s to secure the T1-11 siding. The siding is 3/4 inch thick and very strong and needs the 2x4s every four feet to secure to. And here you can see how the baseboard being level creates straight wall panels. He cut the panels using his circular saw and a chalk line. He measured the higher side and the lower side and then used the chalk line to make the angle nice and straight. He added 1/2x1/2 in. hardware cloth for the windows to make it predator proof. He stretched it across the side posts and attached it with 1-inch wood screws. Then went over it with 2x4s to secure it and frame it. He added supports across the side and below the windows to attach the wall panels. Next up! The dreaded digging for the baseboard again. This coop is built on a slight slope, so the back is further down in the ground than the front. But it's best to keep the baseboard level. These wall panels were all cut at the slight angle of the roof, as you can see. See how you can barely see the lines of the siding? This siding has fittings to go together, but sometimes the cuts can't work out that way. Jeremy did a great job fitting as many as he could together. He trimmed out the door frame with 1x4s. He built the door out of T1-11, framed with 1x4s for stability and to keep the siding from warping. He says, "It looks pretty, and it has purpose." We got the zinc hinges , which are cheaper, and painted them black with some rust-proof spray paint we had already. And that, my friends, is how we Jeremy built my new chicken coop! It's so handy having a handy husband. If you have any specific questions, let us know in the comments. I'll get him to answer; tonight, I kept him up as long as I could, but he's already headed to bed now. Thanks Deborah! I'm glad you can picture the nesting boxes and roost, because they aren't in there yet! We've still got to get the inside done, but we may wait until after we get it all white washed. It's the next big project! It looks fantastic! So roomy! I'm gonna have to pin this one too. Thanks for sharing this wonderful post on The Maple Hill Hop! 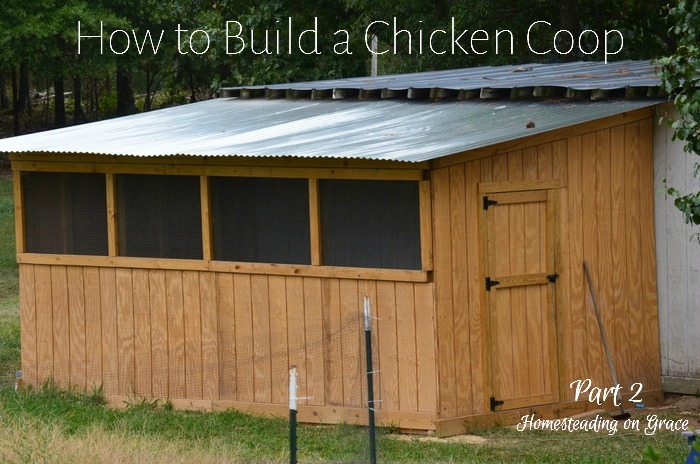 You'll have some mighty happy chickens! Your chicken coop is VERY nice!!! Ours is a bit less desirable to look at though it does its purpose... And I do agree, having a handy hubby on the homestead is a blessing! :) Thank you for sharing with us on the Art of Home-Making Mondays! Thanks JES, glad you're back! I've missed your beautiful posts! That is a beautifully secure chicken run- well done, Jeremy! This is great! I'll have to show my mom. 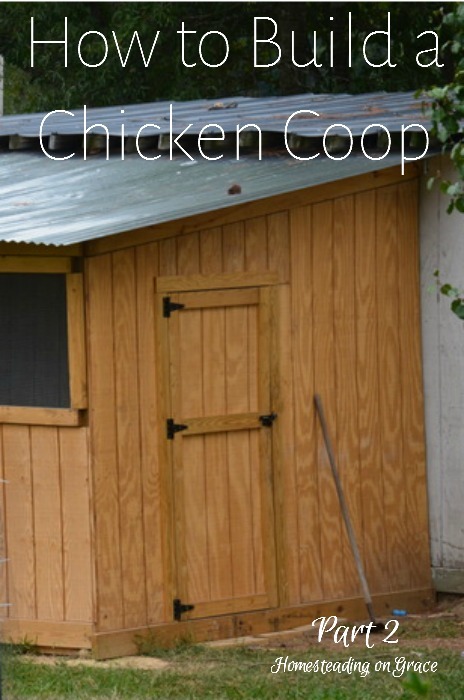 We're researching the best way to build a coop. There are so many cool designs :) We're moving to 40 acres…I'm going to have to explore your blog more to get ideas and tips!